AVALON — Almost a decade of planning is finally becoming reality, as the aging fuel dock at Avalon Harbor is being torn down and replaced. The Avalon City Manager’s office informed residents in a weekly update on Jan. 22 work on the fuel dock, which was originally built in the 1920s, is finally underway. Avalon city staff member Jennifer Monroe confirmed the barge, which serves as the base of construction operations, arrived. The barge included the new pier pilings and a crane, according to Monroe. “The project is slated for completion May 18, 2016 and barring any significant weather delays will be in service prior to the summer season,” Monroe said. She added boaters would have access to a temporary fuel dock during construction. Avalon has sought a new fuel dock since 2007. The California Coastal Commission granted the city $1 million in 2009 to help fund the fuel dock rebuild. Momentum picked up in 2011 when the city developed plans for a new concrete dock. The plans stalled, however, when the price tag for the concrete dock reached $3.2 million. City staff and leaders revisited the fuel dock in 2014 and conjured up plans to update the marine infrastructure for about $2 million. The new fuel dock is expected to be 108-feet-by-36-feet and take up the same footprint as the old venue. Plans also call for workers to remove 74 decaying timber piles and replace them with 55 bearing piles and 19 fender piles. Recreational boaters and tour boat operators regularly use the fuel dock pier, which is located adjacent to the Casino building. A temporary fuel dock was set up near the construction site for boaters to fill up will the new structure is being built. There are four existing fuel storage tanks located on land and next to the pier, according to a Coastal Commission staff report. The report added the storage tanks would not be in service during construction. 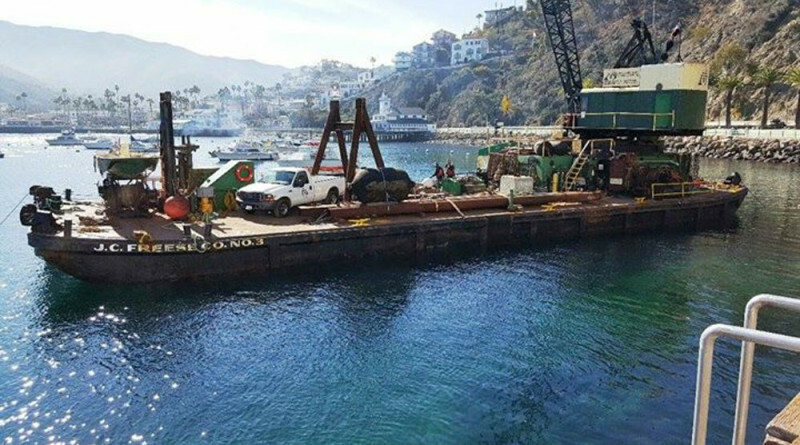 Work is expected to be complete in the next few months and ahead of Catalina’s peak visiting season. Eelgrass will not be impacted by the construction work. City workers also performed maintenance work on Cabrillo Mole Ramp 3, according to city staff.